Potent Solar Flare — Auroras Friday? Please note that the forecast for cloudy skies tomorrow night will cancel our planned Summer Stargazing event on Wild Apple. However, we are planning a stargazing event in mid-September at the observatory. Details on the September event will be posted on this blog when the date is finalized. Come explore the night sky with us on a beautiful, tucked-away farm in Pomfret, Vermont. We’ll be joining the Jones Family at on Wild Apple Road where skies are dark and the stars shine bright. The highlights of the night sky we’re hoping to view will be: the Hercules star cluster, the Ring Nebula, the Andromeda Galaxy, and Alberio (a lovely blue and yellow binary star system), and the Lagoon/Trifid stellar nurseries. There is a possibility we may catch Saturn - the absolute jewel of the sky – before it sets below the horizon. The timing of this event will be weather dependent; the skies have to be clear to star gaze! A notice via the Horizons Observatory blog will be sent out 48 hours before the event to let you know if weather will cancel. If it’s a go, please arrive by 8:30pm in order to avoid headlights in the viewing area. Directions to the site: From Stage Road in Pomfret, take Wild Apple Road for miles. At the top of a steep part, the road makes a sharp turn to the left. Go left. The next drive on the left is the Jones’s place: 2395 Wild Apple Rd. You’ll see a bunch of cars parked there. Layered clothing and a sense of adventure are recommended! If you bring a flashlight, please keep it off near the viewing area – or use red light. One of the reasons we’re trekking so far into the country is to get away from white light – so we don’t want to bring it with us! • 7:00-7:20 pm - Presentation on the night sky in the classroom. • 7:20-8:00 pm – Observatory, including the large telescope in the observing dome, will open to the public. As well, a star tour will occur on the deck. • 8:00 – 9:00 pm - The dome will be used by Woodstock Elementary School and Bridgewater Village School sixth grade students to photograph the Rosette Nebula. It will not be available for public viewing after 8:00 pm. It looks as if some part of Comet ISON has emerged from its close encounter with the sun. However, it now looks to be a headless comet. The nucleus of the comet has evaporated and the only thing remaining is the coma and dust tail. It's still possible that ISON will be visible in the evening sky over the next several weeks, but disappointingly it will not be the Comet of the Century we had all hoped for. It will most likely only be visible through telescopes. But that will remain to be seen. In the image to the left, Comet ISON can be seen emerging from perihelion at the top left. The remains of its tail can be seen at the bottom right prior to perihelion. This image is from the LASCO C2 Solar Observatory. Check out these images from NASA's various solar observatories. STEREO Behind shows it best. Looks like a coronal mass ejection is headed right for ISON (Comet ISON in the lower left of the image).. Of course it could be headed in front or behind but will be interested to see what affect it has. Latest word is that ISON could be in trouble and may be breaking up. Will be interesting to watch as it gets closer over the next 24 to 48 hours and reaches perihelion on Thanksgiving Day, if it makes it that far. Let's hope it emerges from its close brush with death and emerges in all its splendid glory. A clear moonless sky is forecast for tomorrow night - Sunday, November 3rd - so the Horizons Observatory will be open to the public for stargazing from 5:30-6:30 pm. If the forecast holds and it is clear, it will also be very cold (below 20 degrees). Please dress VERY warmly! Please note that the large telescope in the dome will open to the public from 5:30-6:15. At 6:15, the large scope will be used by The Pomfret School sixth grade students to photograph the Great Andromeda Galaxy, so it will not be available for public viewing. Discovered on August 14th, at around Magnitude 6.5 in the constellation of Delphinus, this Nova is continuing to brighten. It is currently at Magnitude 4.5 which is similar to the brightness of the stars in the big dipper. Delphinus is visible in the Southeastern sky after dark. Best viewing will be from dark sites after twilight has faded. The nova will appear like any other star in the sky so will be hard to distinguish from other surrounding stars. Using maps to guide you, locate the diamond shape of the constellation Delphinus and work from there. Update: The brightness continues to climb and as of 4pm EDT it is at Magnitude 4.4 and is considered to be one of the top 30 brightest nova on record. Sky and telescpe has some great information. 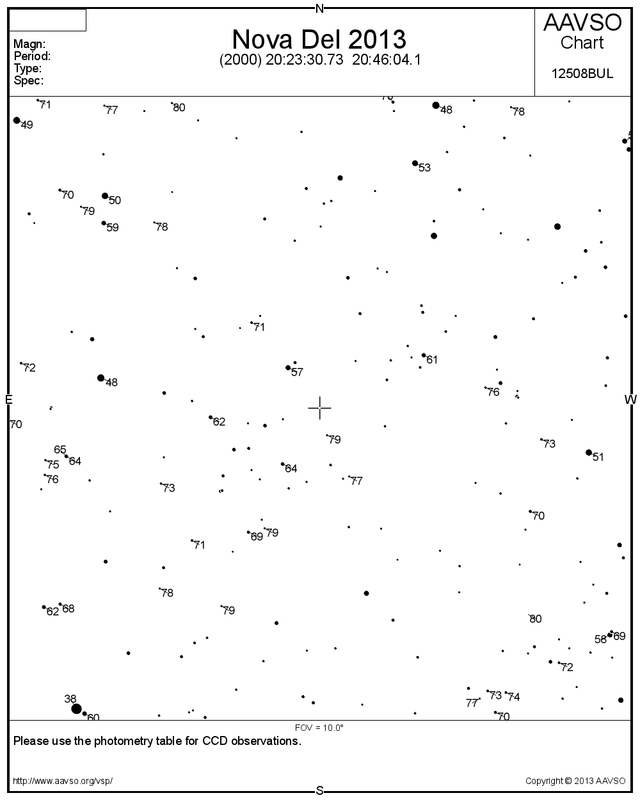 You can follow a brightness plot at the American Association of Variable Star Observers (AAVSO) . We will try to update this as it continues to develop. The forecast calls for clear skies this Monday evening (8:30-11pm), August 5th in central Vermont so the UVLT / Horizons Observatory stargazing event is on! This free event is hosted by Wild Apple Farm in Pomfret (a UVLT conserved property) and led by Horizons Observatory Co-Directors Rob Hanson, Scott Holson, and Paul Otavsky. If possible, please RSVP for detailed directions and site information. The journey to the observation point is not obvious and slightly adventurous so it is best if we know you are coming. Contact Anna Slack at: anna.slack@uvlt.org or 603-643-6626 x102 to register. Come explore the night sky with us on this beautiful tucked-away farm. Wild Apple Farm is a 560 acre property located on Wild Apple Road in Pomfret, VT. It is a unique site for stargazing due to its largely unobstructed horizon and lack of light pollution – almost zero! The highlights of the night sky include the Hercules star cluster, the Ring Nebula, the Andromeda Galaxy, and Alberio (a lovely blue and yellow binary star system), and the Lagoon/Trifed stellar nurseries. There is a possibility we may catch brilliant Venus and Saturn - the absolute jewel of the sky – before they set below the horizon. Please arrive by 8:30pm in order to avoid headlights in the viewing area. As well, please note that this event is weather dependent; the skies have to be clear to star gaze! If clouds move in, the event will be postponed. Sturdy footwear, warm layers (the temperature may drop to the 40s before we’re done), and a sense of adventure are recommended. If you bring a flashlight, please turn it off well below the hilltop – or use red light. One of the reasons we’re trekking so far into the country is to get away from white light – so we don’t want to bring it with us! Join UVLT in partnership with the Horizons Observatory for a stargazing event! This event is hosted by Wild Apple Farm (a UVLT conserved property) and led by Horizons Observatory Co-Directors Rob Hanson and Scott Holson. Come explore the night sky with us on this beautiful tucked-away farm! Wild Apple Farm is a 560 acre property located on Wild Apple Road in Pomfret, VT. It is a unique site for stargazing due to its largely unobstructed horizon and lack of light pollution – almost zero! The highlights of the night sky we’re hoping to view will be: the Hercules star cluster, the Ring Nebula, the Andromeda Galaxy, and Alberio (a lovely blue and yellow binary star system), and the Lagoon/Trifed stellar nurseries. There is a possibility we may catch Saturn - the absolute jewel of the sky – before it sets below the horizon. The timing of this event will be weather dependent; the skies have to be clear to star gaze! A notice via the Horizons Observatory blog will be sent out 48 hours before the event. Please arrive by 8:30pm in order to avoid headlights in the viewing area. Sturdy footwear, layers, and a sense of adventure are recommended! If you bring a flashlight, please turn it off well below the hilltop – or use red light. One of the reasons we’re trekking so far into the country is to get away from white light – so we don’t want to bring it with us! Please RSVP for detailed directions and site information. The journey to the observation point is not obvious and slightly adventurous so it is best if we know you are coming! Contact Anna Slack at: anna.slack@uvlt.org or 603-643-6626 x102 to register.